As an 'armchair' sportsman, I like a good sport scrapbook supply within my stash. Enjoying sport more 'visually' than 'physically' means adding to my sport scrapbook supply at every opportunity! NOT JUST TV SPORTS VIEWING! 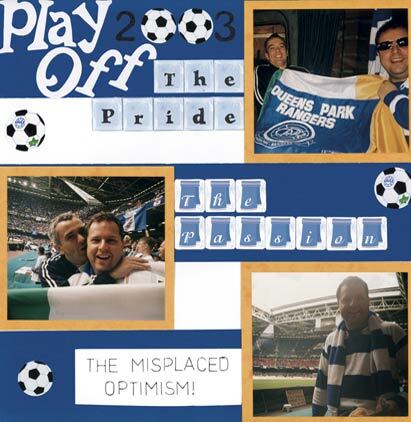 This soccer scrapbook layout- where I was the photographer rather than the subject - is all about the joys of travelling in hope to watch an underachieving team at a major play-off game do what they do best - underachieve. For this tribute to a fun but ultimately disappointing day I chose Blue and White Bazzill Basics cardstock to reflect the team shirt, and I went for amber photo-matting to colour match part of the image - in this case the flag. I didn't feel this soccer scrapbook layout deserved a 'deluge' of embellishments but I couldn't resist some stick-on footballs from Stickapotamus! Let's face it however good we may think we are at scrapping, we can always improve - just like top sportspeople! This is currently the best training regimen I've run across. Big thanks to Gladys Potter for that. As a Brit, I can't resist a bit of irony, and my journaling for this page is an example of creating humour with the number '3'. Your journaling for the first two photos are almost like a set-up for the punchline - which you deliver at photo number 3. Look for natural groups of 3 photos where this might work and scrap them together. You'll have fun doing it! Every time I think about making a layout I um and ah for ages, not knowing how to start it. I might have some great photos, maybe even some great embellishments but I can't get a handle on the 'big picture' - literally. I am therefore hugely grateful to Jen Gormley's superb book ' 500 Scrapbooking Sketches ', that has a ton of great layout frameworks that bust through my scrapper's block every time! What a lot of time I might have saved. Hey ho. This particular layout didn't eat into my sport scrapbook supply too much, and generally I don't like to over-embellish (unless it's my resume.) Sport page kits, like the one I used in my basketball scrapbook layout will give you some great sport embellishments , but don't feel everything in the kit HAS to go on your layout. Keep what you don't use in your sport scrapbook supply stash for layouts to come. HOW ABOUT USING 'CRICUT' FOR YOUR SPORT SCRAPBOOK LAYOUT? Fortunately Brandi Gore, a very experienced Scrapbooker has put together THE manual for using the Design Studio Software both for Cricut and for Cricut Expression - the manual that many people think should have come with the product in the first place. Get yourself a copy and save yourself a pile of frustration! There are lots of great sports scrapbook layouts around, and plenty of sports scrapbook supply for your stash. If you want to create some baseball scrapbook layout pages for that Little Leaguer of yours or an American Football layout then you can use features of those sports in your page design - like the shapes of helmets, field markings, scoreboards, balls, and player outfits. In fact sports collecting can be the ideal opportunity for the armchair sports fan to avoid even more physical exercise - but it can be great fun though! If you're looking for some great tips on how to turn your sport scrapbook supply into a thing of beauty, then Maree Galt's book is as good as any I've found in terms of simplicity and 'user-friendliness' - and way ahead in the 'value for money stakes!' She's even rustled up a soccer layout on page 74. It's not only the more obvious sports that can provide great 'stash-fodder' for your sport scrapbook supply. You can find some Martial Arts Scrapbook Supply if you want your child to find a more gentle hobby than chopping down trees with their bare hands. You can even get hold of some Harley Davidson scrapbook stickers , and make a layout for your grandmother - if you think it's time she slowed down a little. If digital scrapbooking WAS a competition I'd be struggling, because it's all a bit of a brave new world for me. This membership site though is the best One Stop Shop I've found for anyone wanting to embrace the digital scrapbooking age. I went for a soccer scrapbook layout here, but maybe a golf scrapbook would be your thing. There are good page kits and some great embellishments (like old boys in 'plus-fours' swinging a 'brassie') Perhaps you'd prefer an Athletics scrapbook, or to make up some tennis scrapbook pages with a space for a special photo yet to be taken..... Andy Murray winning Wimbledon?? !